DAVE O: Hello Carlos. Thank you for taking the time to talk to us about your life in baseball! CARLOS HERNANDEZ: Thank you for the opportunity you are giving me. DO: You are very welcome! You are from the beautiful country of Venezuela. It has a great baseball history. In what city of Venezuela did you grow up in and at what age did you fall in love with baseball? DO: Who helped teach you the most about baseball? Did you have other brothers who played? CH: Still people even to this day are teaching me how to play! Every day you learn something new in this sport. And yes, my brother played first. My grandfather was a great baseball player too, as was my dad. DO: Tell me about your family – your parents, brothers and sisters? CH: My parents taught me to believe in God and then to choose a path for good. We are 5 brothers and a sister that this year died. DO: I’m so sorry to hear about your sister. I am sure that has been difficult. Are there other players in your city who have played professional baseball? And how famous is Salvador Pérez in Venezuela? CH: There are a lot of professional players from over there. But from the neighborhood where I come from, I’m the first. And Salvador – he has fame anywhere! DO: Everyone loves Salvy! How old were you when you realized you could be good enough to play professional baseball? Was there a particular moment that you remember? CH: I always played baseball and I played it because I love this sport. I realized I might be good enough to play pro after turning 17 years old. I started talking about what I could do and met a scout. He began to explain to me what a Big League organization was, how to get to the Big Leagues and it was from that time on that I started to train harder and I was able to get my signature with the Kansas City Royals. DO: How did Kansas City discover you? Which scout was it? Do you remember the exact moment you first spoke with Kansas City? DO: Were any other teams interested in signing you besides Kansas City? And what year did you officially sign with KC? CH: The Mets showed interest. I signed my contract in 2016. DO: After Kansas City signed you, your family must have been very excited. What did your family say when you gave them the good news? Who was the happiest for you? CH: It was a time where everything was happy. My mom was the happiest of all. My sister was always giving me advice, and my father was also very happy. DO: After you signed with Kansas City, were you sent to the Dominican Academy in the Dominican Republic? I do not see any statistics. Did you ever throw there in a game? CH: I only trained there – they did not play me in that league. They sent me to Arizona for extended and my first year I played in Burlington. This is my second year with the organization. I spent around five or six months in the Dominican Republic, though. The academy is very good! DO: I want to talk about coming to the United States. That had to be very challenging. Were you very homesick at the beginning? CH: I am one of these people where I like challenges. When things are difficult to face, I always want to give more. DO: Have you ever seen the movie about baseball called “Sugar”? 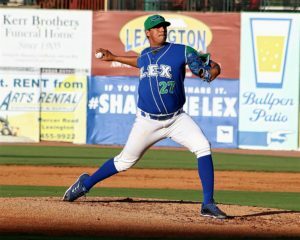 It is about a pitcher from the Dominican Republic who signs a contract with the Kansas City organization and goes to Class A Ball. It’s my favorite baseball movie. He talks a lot about the difficulty of learning a new country and culture. Have you seen it? If not it is necessary! CH: No, I have not looked at it. But it is true what makes it more difficult is speaking English. I always try to give it the best I have. DO: I know you are working hard to improve your English. What kind of things are you doing to help learn English? CH: They have given me an English class, and I’ve improved a little bit from listening to a lot to my teammates. I also use Rosetta Stone as well – it has helped a lot already. DO: I heard Pedro Martinez talk about how difficult it is to order food in the United States when you are learning English. Did you experience the same? What is your favorite restaurant in the United States and do you like American food? CH: Actually I do not have a favorite place to eat. Ordering food is a bit difficult but not impossible. DO: You met many new players when you came to Arizona. Who were some of your teammates that you quickly befriended? CH: Well I already knew some, but other than that one of the fastest I made friendship with was Andres Sotillet. And most of the other Venezuelans. But I get along with all of my teammates very well. DO: Last year you started your career in the United States in Burlington of the Appalachian League. What are your favorite memories of last summer in Burlington? CH: Well, I was learning each game. I always learned something. One of the better lessons was that I was good enough to throw seven innings and strike out nine while only allowing one run. DO: Yes! Your strikeout numbers were great last year! You struck out 62 batters in 62.1 innings. You had a bit of bad luck with your ERA, however, at 5.49. But at the end of the season, were you happy with your first summer of pro ball in the United States? CH: Yes. I thank God that I ended my year well, and I like that strike out number very much. And what I experienced last year helped me to make the adjustments for this year. DO: What adjustments have you made most this year? CH: To control my emotions when I’m pitching and always throw strike one. And, to control what I can control and work on my mechanics. I need to get more strikes and get outs faster. I always go in search of victory but when I have a defeat it is not what I lost, because I only take that as a learning experience so that the next time I can go into it using learned adjustments. DO: This year you have been excellent at Lexington. You have a 3.29 ERA and 82 strikeouts in 79.1 innings. You have started to appear on prospect lists. How much does it mean for you to be recognized? CH: Well I always say that I thank God for the opportunities that he always gives me. And well the prospect lists mean a lot because I did not think I would get what I have so fast. I thank God. I am having a lot of fun. I always walk with a smile on my face. I always enjoy these moments because I do not know when it will be the last one on a team. So, I have a lot of fun being here and I have more fun when I’m doing a good job or when we are winning. DO: You missed your last start because of your arm and have been placed on the DL. How do you feel? What was the reason for the DL stint? CH: My injury is in the triceps. It is 50-50 on whether or not I pitch again this year. I hope that I can. I want to recover and continue to help the team. We are fighting to win. DO: Give our readers a scouting report. What pitches do you throw? Where is your speed at this moment? Where do you sit? And where do you top out at? CH: I throw a fastball, straight curve and change. The hardest I’ve thrown is 99. My last game I hit 97. DO: We read many good things about many of your teammates in Lexington. I want to ask you about some. How do you like throwing to MJ Melendez? And how fun is it watching Seuly Matias hit? CH: I always say that in front of a good pitcher is a good catcher. MJ is very good. And Seuly is a tremendous person. Over time we will be watching him play in the Big Leagues. DO: I have a few last rapid fire questions. These are fun questions to learn more about you. Ready? CH: Ok, that sounds good! DO: Do you like dogs or cats more? I think I’m the only man who loves cats. CH: (Laughs) I like dogs more! DO: (Laughs) I figured! Has your family ever come to the United States to watch you pitch? CH: No, they have still not been able to come see me throw. DO: What is your favorite baseball movie? CH: I do not have one. But “42” is good. DO: You need to see “Sugar!” Who is the funniest player with whom you have been teammates with in the Kansas City organization? CH: (Andres) Sotillet. Him and I just have a lot of fun. DO: If you were not a professional baseball player, what kind of career would you have? Would you have gone to college? CH: Really, I do not know. I’m not very good at studying and well, I’d really only work. DO: Did you collect baseball cards when you were a kid? Do you have them in Venezuela? How exciting is it having your own? CH: I did not have the opportunity to do it. But now that I have some of myself, I feel proud. DO: Are there a lot of Kansas City Royals hats and t-shirts in your hometown now? CH: Yes! There are some in the neighborhood where I live. I gave some to my friends and relatives and neighbors. DO: And my last question. What would you like to say to Kansas City Royals fans reading our interview? CH: The first thing is that I trust in Almighty God all the power that will give me the opportunity to play in Kansas City. And I will do my best to help Kansas City get victory! DO: Thank you very much for your time. I am very happy that you are with the Kansas City organization. CH: Thank you for this opportunity!